While the question of where exactly Metropolis is meant to be on the eastern seaboard of the US may never be answered, science may well have settled the question of where Krypton, the destroyed home of Superman, once was. And who else could settle such a mystery then Neil deGrasse Tyson? According to DC Comics publisher Dan Didio, a staffer working on Action Comics reached out to the internet-favourite astronomer for assistance on a storyline, during which Superman searches for his home planet. Tyson, known for having called James Cameron out for improper star positions in Titantic, and for pointing out Damon Lindelof's problems with distance in Prometheus, was more then able to lend them a hand, and delivered a viable candidate. The star in question, a red dwarf designated LHS 2520, sits 27.1 light years away, in the Corvus constellation. This distance is approximately the age of Superman in the current comics run, though that creates issues in and of itself, as Jor-El's ship obviously had faster-then-light capabilities, able to get the infant Kal-El to Earth while he was still an infant. A correlation between the distance and age of Superman would only apply if he had only just arrived on Earth, and emerged a fully grown man (I've given up on the New 52 - that isn't what actually happened, is it?). 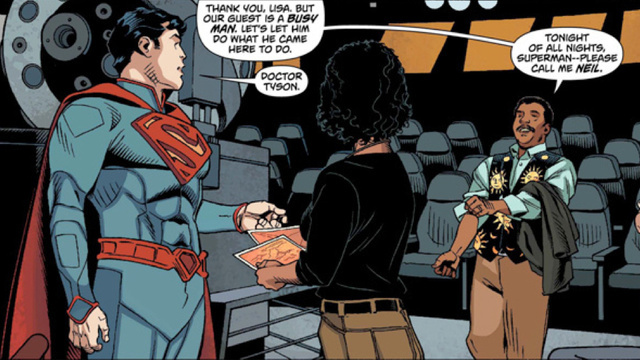 As thanks for his contribution, Tyson has been incorporated into the comic, appearing (as seen above) in Action Comics #14. It also marks the latest change in Krypton's location, after the Richard Donner movie implied it was several galaxies away, and John Bryne's run in the late eighties placed it within 50 light years. Both of those sources also placed it in orbit around a red giant, rather then a dwarf. Either way, it remains both fictional, and destroyed (unless they retcon that too... the destroyed bit, not its fictionality).